In the world of jewelry there has been an uncommon union between delicate fine metals and chunky antique and vintage typewriter keys, producing unique typewriter key necklaces. After the keys have been removed, filed and polished, jewelry artisans use them to craft their individual creations. The most desirable keys for jewelry making are those found on typewriters from the late 1800's through the 1940's. 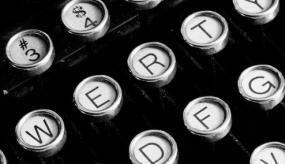 During this time most of the letters of the typewriter keys were printed on paper. The paper discs were protected with metal on the bottom and a glass or celluloid disc on the top. A metal rim, usually made of nickel, sealed the pieces together. Also at this time there were typewriter keys that were made out of Bakelite with the characters imprinted on them. Necklaces made from typewriter keys can be personalized by using the keys as initials or to spell a name. Other necklaces are created using random letters; others spell a single word or make a statement. One popular style includes a pendant-type necklace with a single typewriter key suspended from a sterling silver pallini chain. Two other highly sought after styles include several keys attached to a sterling box chain with silver spacer balls, and a pendant made from two keys, such as an x and o, attached together vertically and suspended on a hugs and kisses chain. Sterling silver is the precious metal chosen most often when making typewriter key jewelry since it blends beautifully with the polished nickel of the key rim and the delicate timeworn colors of the keys. Each typewriter key is generally set with a sterling silver bezel that can be attached to almost any style of necklace, even if the necklace choice is not sterling. The typewriter key pendants can also be hung on chains of white or yellow gold, costume jewelry metals, and leather or velvet cords. Another method of mounting a key is to set it into a bezel that has an opening on each side. A ribbon, often made to resemble an old typewriter ribbon, is then slipped through the side openings and snapped or tied in the back, creating a choker necklace. In addition to necklaces, old typewriter keys are used to create many other types of jewelry. Often the keys are linked together to make bracelets or watch bands, or suspended from bracelets as charms. Earrings and cuff links frequently show the world the wearer's initials, while favorite numbers are popular on money clips. Vintage typewriter keys adorn belt buckles, rings, and key chains, each one combining a cast-off into a beautiful piece of jewelry. A variation of this type of jewelry involves removing the original character from the inside of the typewriter key and replacing it with tiny pictures, designs, or precious stones. 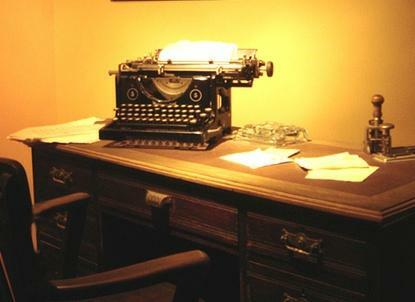 It is believed that there are millions of old typewriters rusting away in basements, garages and attics. The going yard sale price ranges from $2 to $20, and they are often given to anyone that even looks their way and is willing to carry them home. Using their keys to make jewelry gives people a chance to own a small piece of the technology of years gone by. Younger generations love the uniqueness and charm this type of jewelry offers, giving them the opportunity to own an antique that is personalized and beautiful. Many baby boomers and seniors remember clicking away at those old worn keys, and wearing a typewriter necklace or other piece of typewriter jewelry gives them a nostalgic feeling, a connection to their past.